This light gel is very hydrating and nourishing. It can be used all skin types as it acts as cellular stimulant helps to eliminate wrinkles and encourages the production of new skin cells. 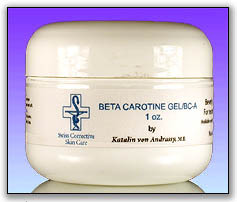 This very powerful anti-aging BC-A GEL leaves your skin feeling smooth and soft. Apply a thin coat to face and neckand desired area after cleansing.Recommended for all skin types. Deionized Water, Propylene Glycol, Glycerin, Beta Carotene, Aloe Vera, PCA, Carbomer 940, TEA, Panthenol, Allantoin, Diazolidinyl Urea, Methylparaben, DMDM Hydantoin.